The summer is finally here! Host a July celebration by throwing a July 4th party. During this celebration feel free to show off your patriotism by displaying your best American traditional foods and decorate in your red, white and blue. Your 4th of July Party is a fantastic way to kick off the summer party season. 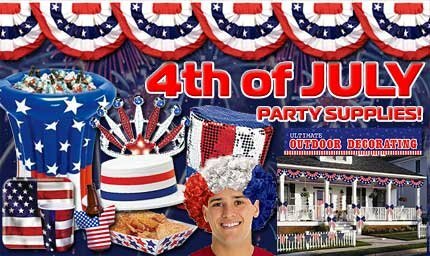 This Patriotic Party Wear Kit for 25 people comes with a great assortment of party wear: Plastic Top Hats with Printed Band, Glittered Tiaras, Horns, Leis and Throws. Horse shoes. Great game for all ages! Relay races – potato sack, three legged race, egg ‘n spoon, etc. Looking for 4th of July games? Your Independence Day party guests will love these fun and beautiful printable 4th of July party games! Includes Mad Libs, Left-Right gift exchange game, synonyms word game, Patriotic Trivia, Red White and Blue scavenger hunt, Independence Day Trivia and much more. For Foods, Think of a traditional BBQ! Share Your July 4th Party Ideas Here!